Arif and Melani are lovely hosts,they will help u in anything that you would need! Very good resturant here,fair price. Metro is 3 minutes walking,very helpfull to roam over the city.Free pickup from the train station,the rooms are big and the balcony is amazing! Very good place to celebrate the Holy Festival. Would definitely come back to this place a second time. Arif and Melanie are really lovely people and the hostel is in a very quiet location which is nice if you want to chill out. We really enjoyed our stay at Sundeck. Arif was a very helpful host, providing us with a map and information. We didn't find a lot of places to eat around, but Melanie provided us with delicious food. The free pick up from the train station was very convenient. The metro is just one block away. There weren't a lot of people there during our stay but Arif and Melanie were kind enough to drive us around at night to see the Diwali lights and allowed us onto the hostel roof to watch the fireworks. 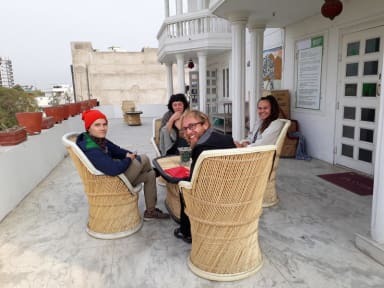 We stayed at the sundeck during the holi festival and it was the best hostel on our 4 month round asia trip to date! The owner arif made us feel more like family than guests and the sundeck itself makes the hostel perfect as a relaxed chillout place to be. 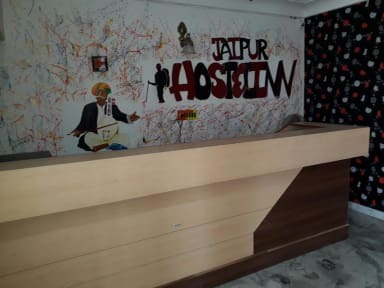 Whether you,re passing by jaipur or planning to explore, the hostel gives you a very homely place to base yourself and we would definetely recommend this! Awesome place to stay in Jaipur! Arif is a great host and his wife Melanie cooks the best food. The neighbourhood is quiet and relaxing, and is roughly a 15 min uber into the Pink City. Overall, a comfortable and relaxing place to stay. Arif and her wife are great hosts, very caring, always willing to help. Free pick-up from Train/Bus Station. Tasty breakfast for an affordable price. Nice location few meters away from Metro Station. Recommended! The house is grand and very clean, but it's really more of a homestay/guesthouse than a hostel. There is no shared kitchen that you can use and no real check- in desk or point of information. Arif and Melanie were helpful and the food we ate was delicious. The house was in a nice and relatively quiet area near the metro, but for some it may be a bit out of the way.